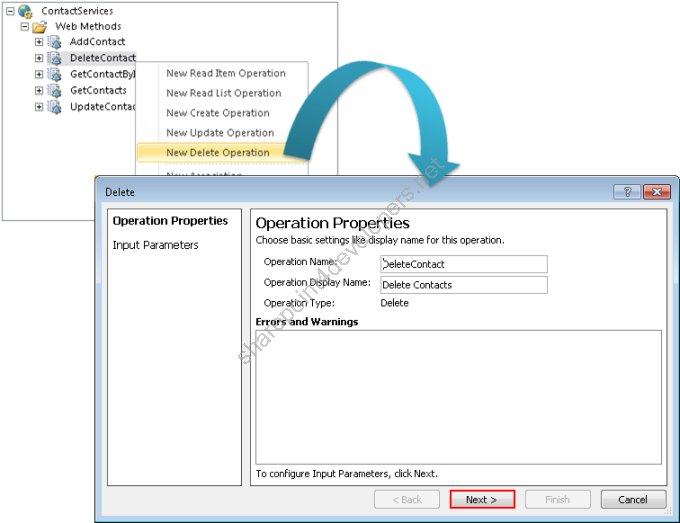 Learn how to integrate WCF services in SharePoint 2010 through Business Connectivity Services. This is a very interesting approach because it allows that different services (including the cloud) to be integrated into SharePoint 2010. After a mini holiday here there is one more part of the BCS series, whose main approach is to show how to connect to different external data sources. 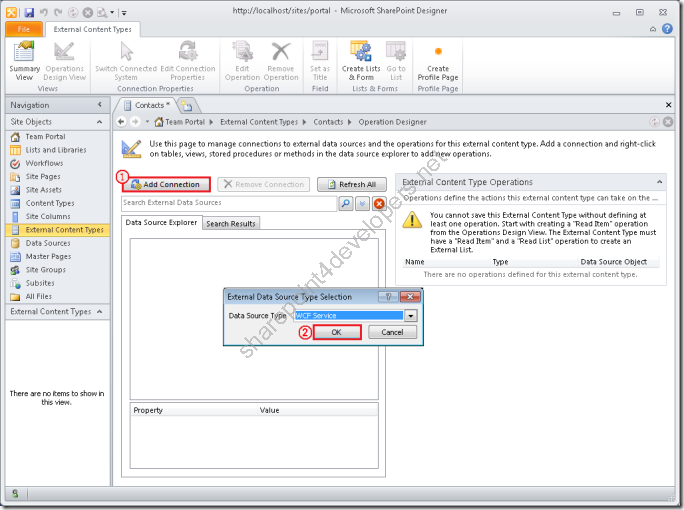 In this article a WCF service will be created, so an External Content Type (ECT) can be created. In order to create ECTs via Web Service it is needed the utilisation of SPD2010 and in this case, due to the fact the Web Service is going to be coded from the scratch, VS2010 is required as well. If you have this scenario, this implementation has a higher level of difficulty by creating the Web Service. 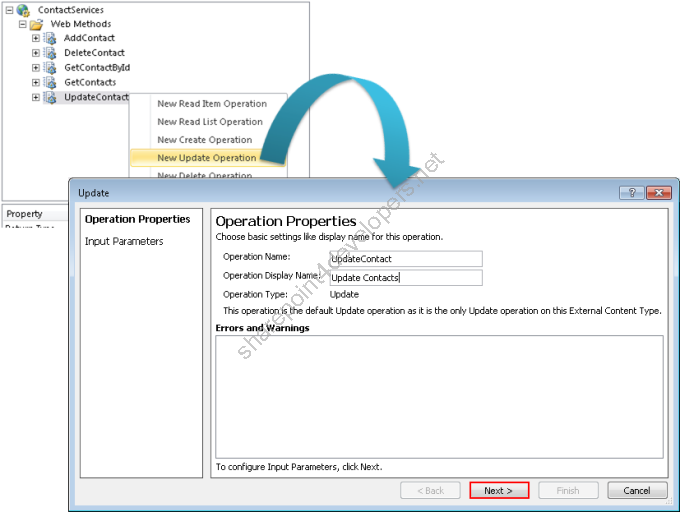 Both VS2010 and SPD2010 are utilised, the former for the Web Service development and the latter for the configuration. The creation of the ECT in this approach is only possible with the existence of a Web Service, that's why a solution in VS2010 is going to be created. 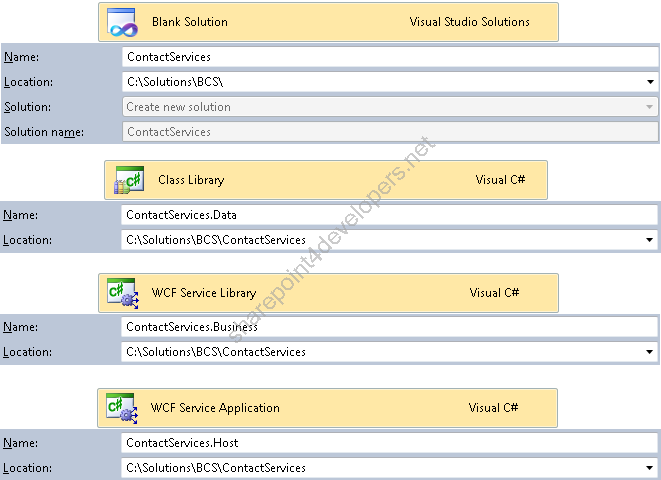 As already mentioned in the Block 1 of the BCS Architecture (Part I), both extensions .asmx (ASP.NET Web Service Application) and .svc (WCF Service Application) can be used in the creation of ECTs, and in this demonstration I am going to use a WCF Service Application. Note: Delete the files *.cs and App.config that are created by default in new projects. 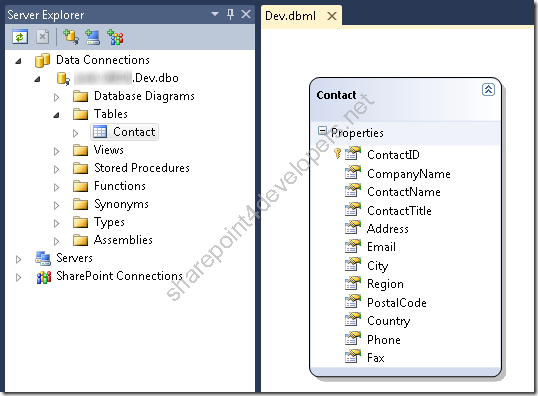 Note: In all code examples, my goal is just to show the functionality in creating an ECT in SharePoint 2010. Don’t forget to implement the best practices and patterns such as the Application Blocks (i.e. : Logging, Exception Handling, Security, etc...). I strongly recommend the use of Enterprise Library. 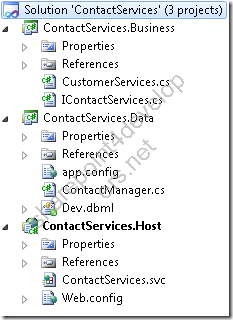 The class ContactServices contains CRUD methods that are going to be used by the BCS and tell by themselves. They work as a "thin layer" for handling data, because directly call the ContactManager methods in the project ContactServices.Data. In this example no business rules were implemented, but you can if you need them. Just code against the methods above. Note: The behavior serviceDebug contains the attribute includeExceptionDetailInFaults to list in details any Web Service problem in the SharePoint Log, which is very useful during the WCF integration tests. 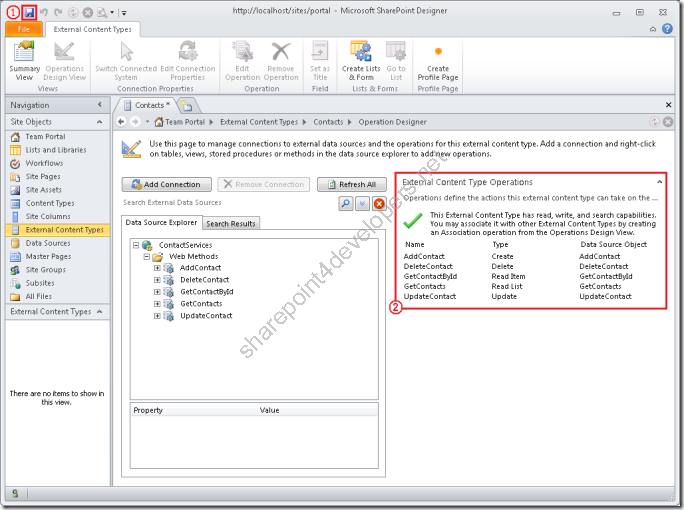 Deploy the solution in the IIS, so you can get the Url for creating the ECT, as demonstrated in the next sections. The WCF metadata can be obtained through WSDL or endpoint Mex. Both of them can be informed in the fields Service Metadata URL / Metadata Connection Mode, and are available in this solution. 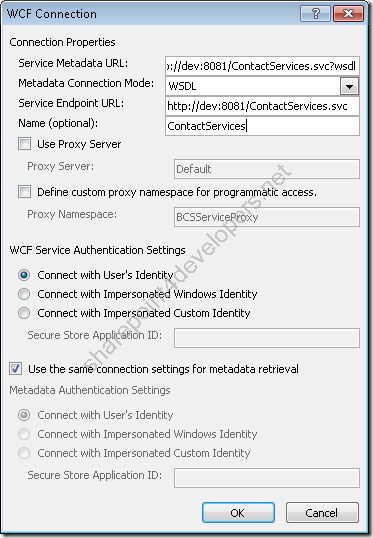 The User’s Identity can be used to connect to the WCF service and hence to the database, that’s why the Windows Authentication is required. 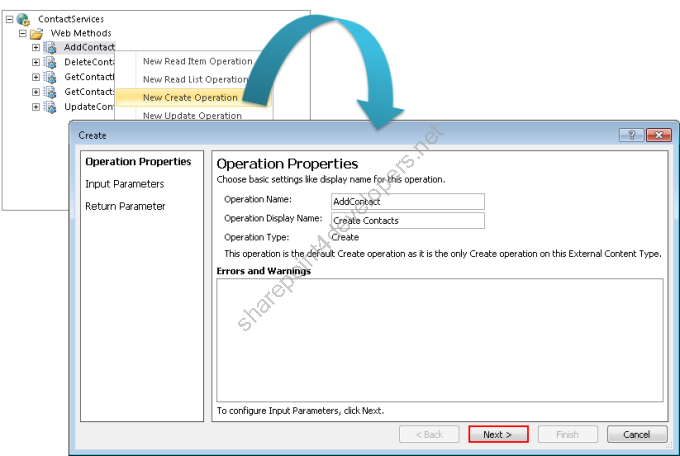 There are no Return parameters to be configured for the operation AddContact, so simply ignore the configuration screen and finish this mapping. Note: Notice that in most cases just the configuration parameters (columns) nomenclature changes, but data is the same. I have decided to create configuration tables for each operation in order to facilitate the mapping with separate operations. When the External List is created, the purpose of this article is accomplished. 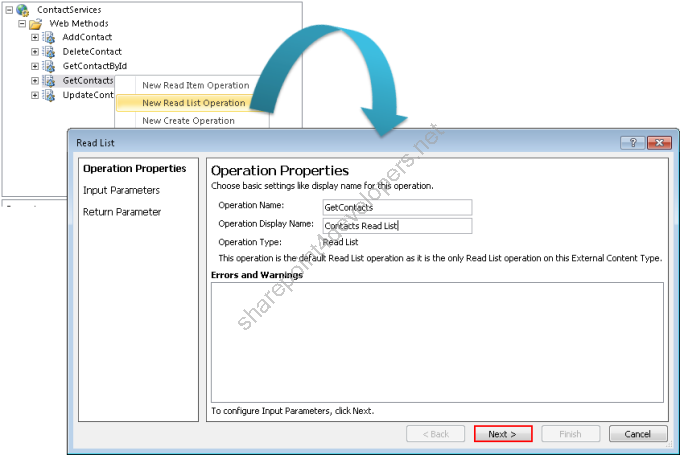 Now it is up to you to test the External List, which was already explained in the Part II. Reuse the same test and apply it here, since it was created for this purpose. 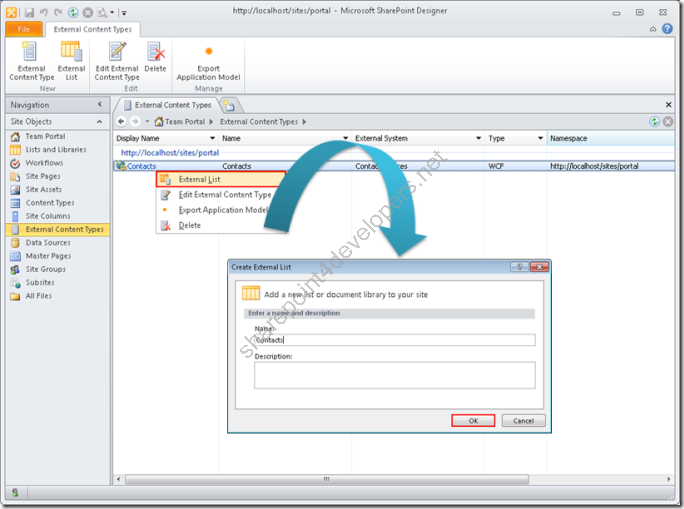 The fact of using a Web Service for integration in SharePoint 2010 shows us that it is possible to transmit data from and to any system that provides this interface. 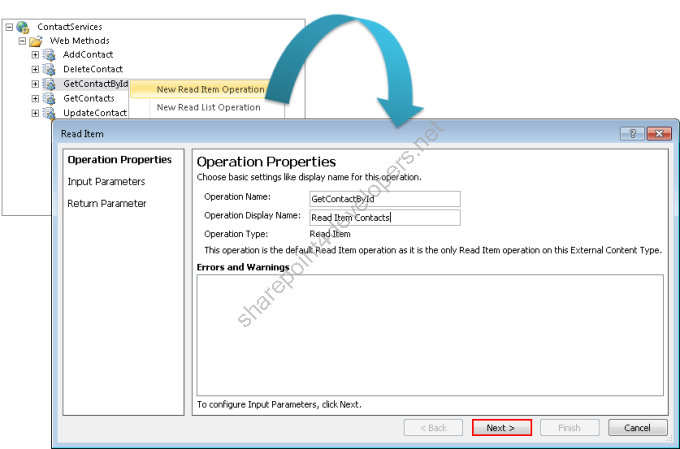 Unify data from different systems in SharePoint 2010! Now you know how to do it! Click here to read the same content in Portuguese. 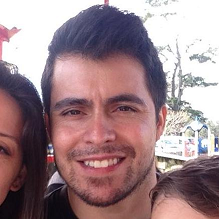 Marcel Medina is a specialist in .NET/SharePoint development. Currently working as Microsoft Consultant and Trainer in these technologies. He has 14 years of experience in the IT area and the following certifications: MCP, MCDBA, MCAD, MCSD v1, MCTS (including WSS 3.0, MOSS 2007 & SharePoint 2010, Application Development), MCITP (SharePoint Administrator 2010), MCPD (Enterprise Application Developer 2.0/3.5 & SharePoint Developer 2010), MCSD SharePoint Applications, MCSA Office 365, MCSE SharePoint and MCT.